Cristina Moracho’s debut novel Althea & Oliver, portrays the effects of Kleine-Levine Syndrome, a rare sleep disorder that causes long term periods of sleepiness and childlike mental acuity. Teenager Oliver finds himself struggling with the disease and Althea, his friend from the age of six, has to grapple with the results. 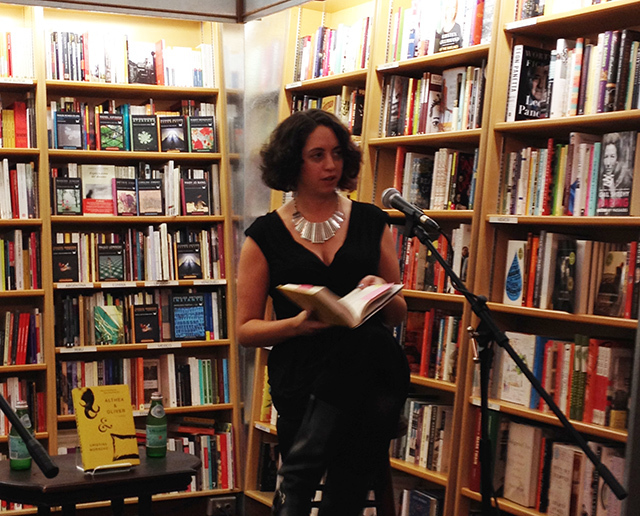 Moracho was joined at McNally Jackson with her editor Sharyn November for conversation. The genesis of the book arrived when Moracho was in graduate school. She says she had grown tired of writing “those terrible” short stories. She learned about KLS syndrome about the same time she thought up the character of Oliver and decided she would write something more substantial. She committed herself to writing a novel instead of workshopping any more stories. “This is a book written mostly at night and weekends,” she says adding that its really hard to write a book that way. “I rather be left alone,” she adds. Nevertheless, the creative process of bringing a book into the world requires more than one person and she agrees with November that the relationship between author and editor is like having two minds working toward the common goal. When it comes to authorial influence however, Moracho would prefer her prose feel free of anyone else.”I don’t think you’ll see Hunter S. Thompson no matter how much I love him,” she says. The book took six years to write. It took at least four years to create the full, real feeling adult characters, and not just primary characters of Althea and Oliver, teenagers. For a while, she wanted to exclude the adults entirely. Eventually though a professor sat her down and explained she needed to commit to having adults in the narrative. The perspective of the novel is split between Althea and Oliver, alternating chapters as the narrative progresses. She says she knew she wanted to avoid third person, but it was tough to keep the timelines organized since the events took place chronologically, especially while switching between the characters. KLS syndrome a real disease, and for that she did a certain amount of research to get an accurate understanding. Eventually though she says she had to stop researching the topic. Watching the videos of people suffering from it wore her out. She also had to do research for the setting. For a long time she thought of the world as a generic analog world — cassette players, VCRs, non-digital technologies. But ultimately the vagaries didn’t work. She had to pick a specific time or risk flirting with magical realism. She chose a date–1997–and then suddenly had to make sure everything was accurate for the year. One anachronistic mistake made it as far as the galley proofs. The novel eventually leads the characters to Coney Island, home of the Nathan’s hot dog eating contest. In recent years, an electronic clock counts down to the next contents. The clock did not exist in 1997, but Moracho wrote it like it was. She had to scratch it before going to press with the final book. Moracho also had to research the suburbs. She grew up in New York City and had no idea what teenagers did in the suburbs for fun. “I would not have called myself tenacious before this book sold,” she reflects. Early on in Althea & Oliver, the book had a magical realism component. Moracho saw it as a kind of fairy tale. It was a story that was more sinister. The hospital seemed to be part of that rather than a way to make Oliver better. It didn’t feel real. Moracho is working on a new project now, a murder revenge noir. The new project might require that she write an outline, a tool she says she doesn’t usually rely on. She’s been making notes on a chalkboard wall in her apartment, like a map of the new book. But most of the time she prefers writing into the darkness, and with Althea & Oliver, that preference might be why she took so long. Typically she works with an extra digital document alongside her manuscript. Its a technique she learned from Alexander Chee. She describes it as a kind of blogroll of her writing with the date and important information regarding what she has written that day. Pieces that are cut away are also there, just in case she needs to bring them back. Writing with background noise is important, but rarely does Moracho listen to music. She can listen to maybe one or two specific albums on repeat, but not a random selection of music. Her preferred background noise is movies–Jurassic Park, The Usual Suspects.